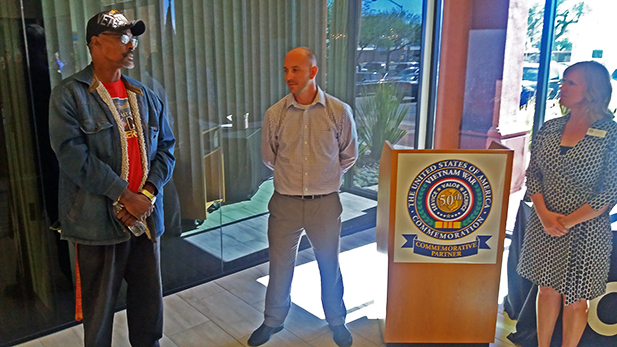 / Modified nov 28, 2016 3:40 p.m.
Peter Starks, left, recounts his service to Keith Hamblin, Tucson Vet Center outreach specialist, and Lindsay Dearing, who spoke on behalf of Congresswoman Martha McSally, November 2016. The Tucson Vet Center honored Vietnam veterans last week as part of an ongoing celebration to mark the 50th anniversary of the Vietnam War. Among the approximately three dozen veterans honored was Peter Starks, who served as a corporal in the Marines. Starks entered the war at age 17, skipping his senior year of high school. He deployed to the city of Da Nang on Vietnam’s central coast. There he was wounded twice in 1968, hit in the forehead by shrapnel and shattering his knees in a tower explosion a few months later. He refused to come home after both injuries. “Because that was family. Those guys were my family, you know, through all the chaos, through all the hardship, good times and bad times - only people I trusted,” Starks said. Starks says the war altered his life forever but he cherishes the fact he’s able to touch bases with his brothers today. “I tell you what, I wouldn’t change nothing. I wouldn’t change anything because the relationships that I built there, those were the only people I ever trusted in my entire life, to include my family,” Starks said. Veterans received pins and certificates signed by President Barack Obama. The 13-year commemoration will continue through Veteran’s Day 2025.